As you’ve heard, this week Apple unveiled not one but two new iPhones, the long rumored iPhone 5C and iPhone 5S. From all the rumors and leaks it seems that we’ve seen everything with these phones months ago but this week Apple made it all official. Both the iPhone 5S and 5C go on sale next Friday (and the 5C is available for pre-order tomorrow), but to help you decide on which iPhone is right for you we’ve rounded up everything that’s new and what you need to know about in each phone below. The iPhone 5S is the successor to the now discontinued iPhone 5 (Apple replaced the iPhone 5 with the 5C). Like the 3GS and 4S before it, the iPhone 5S keeps pretty much the exact same design as the iPhone that came before it but adds in some nice spec upgrades and a couple of cool new features. For the 5S, this means a much faster A7 processor, a better camera and of course, the fingerprint sensor on the home button. Let’s start with the processor. Like all “S” iPhones Apple gave the 5S a very nice speed boost. The new A7 processor is 2x as fast as the iPhone 5’s A6 processor in both performance and graphics which means that everything you do on your phone will be a lot quicker and the games you play will look much better (and the iPhone 5 was pretty fast already). Now for those worrying that this new power will mean less battery, well you shouldn’t. Remember all those rumors about a bigger battery in the 5S? Well, that plus a new M7 chip (designed to help take some of the load off the A7 and make it more battery-efficient) should help keep the 5S’s battery on a similar level to the battery life of the 5. 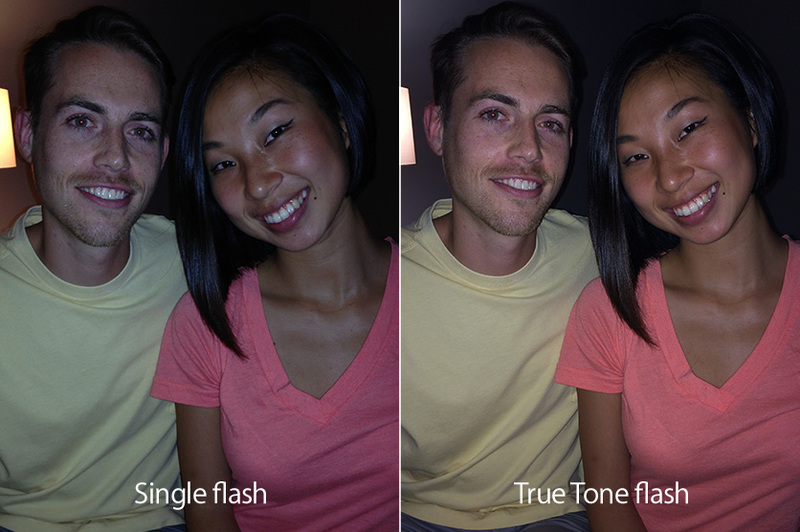 On top of the new flash and better sensor Apple also took advantage of the new A7 chip and made auto-focus faster on the 5S and added a new 120 FPS “slo-mo” mode to the camera app that will let you, well slow down parts of the video to make a cool action scene. The front FaceTime camera got an upgrade too and now takes better photos and video for better selfies and HD FaceTime chats. Last but not least the 5S added on new hardware feature– the Touch ID fingerprint sensor. Located right in the home button you’ll be able to do things like unlock your iPhone and buy things from iTunes and the App Store without having to type in passwords. One of the most annoying things about the App Store is how you constantly need to enter in your password and this is a really cool and secure way to get around that. Otherwise, the iPhone 5S has pretty much everything the iPhone 5 had. It has pretty much the same design (so iPhone 5 cases will fit on it though not perfectly because of the larger camera sensor and flash), same 4-inch Retina display, Lightning port, and runs iOS 7. All that being said it’s a pretty nice upgrade and if you’re looking for a new iPhone is probably the one to buy. The iPhone 5S will be available in grey, white or gold on September 20th (a week from Friday) for the usual prices of $199 for 16 GB, $299 for 32 GB and $399 for 64 GB with a new 2 year contract from AT&T, Verizon and Sprint. T-Mobile will also be selling the iPhone 5S on the 20th but they haven’t yet announced how much it will cost (you can get it unlocked starting at $649 for the 16 GB version). So now that we covered the 5S let’s move to the iPhone 5C, or the more colorful, plastic iPhone 5. Unlike the 5S the iPhone 5C didn’t see as many internal hardware upgrades and is pretty much the iPhone 5 inside a new, much more colorful case. With the exception of the new FaceTime HD camera that the iPhone 5S has, it’s pretty much same phone as the iPhone 5. Same iOS 7, A6 processor, 8 megapixel camera (without the bigger sensor and better flash), and 4-inch Retina display. Now there is that “C” in the name and as you could guess it stands for color. Unlike the iPhone 5S which comes in just black, white or gold, the iPhone 5C comes in five different colors– blue, green, pink, yellow and white. And it looks nice. If you wanted a colorful iPhone or just don’t need all the new features of the 5S, this is for you. Apple also has come out with a bunch of cases for the 5C in a variety of colors to help you make it even more of your own. The iPhone 5C will also be available on September 20th at AT&T, Verizon, Sprint for $99 for the 16 GB version or $199 for the 32 GB version (with a new 2 year contract). As with the 5S T-Mobile will also be getting the 5C on September 20th but we don’t yet know their pricing (it will cost $549 for the 16 GB unlocked). You can pre-order the iPhone 5C tomorrow, September 13th. So, do these new iPhones impress you, and if so which are you gonna get? Posted on September 12, 2013, in Apple, Cell Phones and tagged Apple, apple iphone, Cell Phones, ios 7, iPhone, iphone 5, iphone 5c, iphone 5c release date, iphone 5s, iphone 5s release date, new iphone 5c, new iphone 5s, new iphones. Bookmark the permalink. Leave a comment.